It's been a while we enjoyed unlimited browsing on Etisalat network; all we've been managing all these while is the Etisalat 60MB free browsing cheat that only allows us to use just 60MB of data daily. But rejoice, i have a working Settings to browse on Etisalat unlimitedly with N0.00 naira and no data. This is the first free browsing cheat popping out for the year 2017, and it's time for us to enjoy the most outta this cheat before it gets blocked. Please and please, use this cheat wisely and less-share it so that it won't get blocked. I will quickly drop my settings here for you guys. Before that, i will urge you to sharpen your Etisalat sim as i reveal my settings lol. *- After installation is finished, go back to the app homepage and select the 'REMOTE TWEAK' option in server list. *- Now, tap on CONNECT to start connecting Tweakware and wait for it to get connected. It will get connected within 10 seconds, and when it's connected, just launch your browser and start browsing, downloading and streaming movies. It doesn't disconnect at all. This Remote Tweak Is Removed If You "force Close" the app Or "exit" the app Or Reboot Your Phone. In That Case You Have To re-do The Above steps Again To Get The Remote Settings Back. Anyway, i have a trick to Install the Remote Tweak without active data. See the post Here. If You Get Error Of "remote Tweak Installation Failed" Even When You Have Working Internet Data, Then It Is Possible That The Remote Tweak Server is Down. You Can Try Again Later Or After A Few Hours. -* You Need A Premium/upgrade Account To Use Tweakware For Android Or You Can Use The Free Servers Without Upgrade/payment But You Will Be Limited To 350mb Per Day On Free Servers. upgrading To Premium Costs Only #500 And Gives Access To All The Servers Without Any Daily Limit (unlimited) and valid for 1 Month. For me, i didn't encounter any problem while setting this up. Though, I'm a premium user, and I'm just surfing like jet here, as we all know that Etisalat has a good network coverage. Besides, there's no speed throttle, it's unlimited and absolutely free. You can as well use this cheat on your PC, kindly follow the guide Here. Confused or having problem while setting this up? I'm here to help, just comment below and i will reply ASAP. Etisalat unlimited free browsing cheat for Tweakware v5.8. 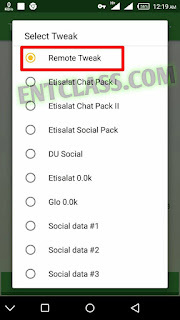 Settings for Etisalat free browsing cheat Tweakware v5.8 apk. Latest Etisalat unlimited tweakware free browsing cheat. Visit tweakwarevpn.net and create an account. In your dashboard, you will see BUY PREMIUM. Make sure you pay with your ATM MasterCard for instant activation. How Much is Premium Kachi? Victor, your head is there. It keeps showing 'install remote tweak' everytime I open d app 😢, pls, how do I save d installed remote tweak permanently? You can't. I have explained this in the post above. You don't really have to empty your account. Does it disconnect for u because mine is always disconnecting and when I try to reconnect..it shows "maximum number of free users reach ..try again later"
That's the problem of Free Servers. Get a premium account and enjoy yourself . Check the post again. I just updated the download link. My Tweakware Etisalat has no problem. It's connected here for over 4hours without disconnecting. Though, I'm a premium user. Switch back to 3G, then reboot your phone. Connect your Tweakware again and it will connect. Hope it helps? Like seriously, i haven't experienced such. I download and browse without any issues. I think dis has stop working not connecting here...any one with d info? I noticed that too this morning that it has been blocked. Victor pls i just paid for a premium account.. pls whats the next step.. Which cheat do you want to use it for? Use Etisalat default APN settings. Meanwhile, the cheat is no more working.